CAN YOU SURVIVE THE DARK NIGHT OF THE SCARECROW? 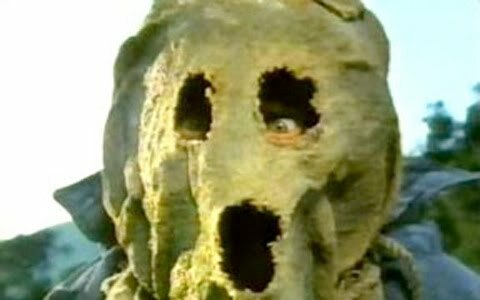 Join me as I put on my overalls and seed cap and head back in time to 1981 to visit one of the scariest made-for-TV horror movies ever, "DARK NIGHT OF THE SCARECROW". This rural fearfest made a lot of people scared to walk past the cornfield back in the day and it's reputation lingers today. I take an in-depth look at the origins of the film, the plot which finds a gang of vigilante hicks haunted by what could be the spirit of an innocent man they murdered in cold blood and general impressions of what makes it so effective. The movie stars LARRY DRAKE and CHARLES DURNING among others and you can check out the scare-card right HERE! Some good news, Worm-fiends! None other than SGT. DETH is set to return to the Chronicles soon! Sarge has been recovering from his previous Wormwood stint at the VA hospital for the last few years but is now ready to re-enlist. You'll be seeing reviews from him on SWORN ENEMY and PRONG soon, with many more hopefully to come. Welcome back, Sarge! On the bad side, it looks like our latest doom/stoner writer has taken a dump on us again, so if any writer out there is brave enough to join the WC and has more than an ounce of commitment in them, please contact me at drmality@sbcglobal.net! Now for the auditory atrocity that is the latest edition of the Wormwood Torture Chamber! RINGWORM "Hammer of the Witch"
ICED EARTH "Plague of Babylon"
ENTHRALLMENT "The Voice of Human Perversity"
ONE MACHINE "The Distortion of Lies and the Overdriven Truth"